With the acquisition of C.J. Mosley, the New York Jets have little reason not to explore a trade for Lee. While Lee’s cap hit is a mild $3.2 million compared to his counterpart Avery Williamson’s $8 million, Lee has underperformed as a former first-round pick and was handed a suspension that ended his 2018 campaign early. With all that in mind, the Jets have a clear pairing set between Mosley and Williamson moving forward, leaving Lee the odd man out. After earning sub-50.0 grades in his first two years out of Ohio State, Lee had his best year yet in 2018 with a 72.4 mark. However, Williamson out-graded him with a 74.3 overall grade and has proven himself as a consistent force through five years in the league. Lee was generally productive in 2018, though, and that should have other teams interested in his low cap number and seemingly budding skill set. Nearly a year ago, the Minnesota Vikings exercised Waynes’ fifth-year option, putting them on the books for a $9 million cap hit. 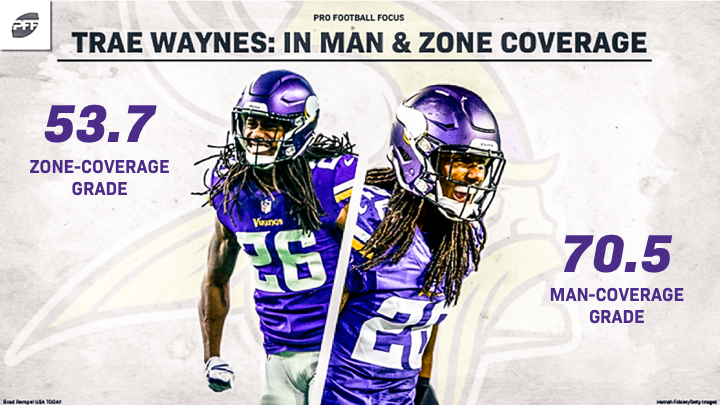 While Waynes has been a relatively solid option as a No. 2 cornerback, his salary in combination with rookie Holton Hill’s emergence gives the Vikings an opportunity to shop him around. Waynes has yet to allow a passer rating in coverage above 100.0 in his four seasons, but his expected improvement arc as a former top-15 pick hasn’t been quite as evident. His low-floor, high-ceiling playstyle was evidenced in his Week 4 and Week 7 performances. Against the Los Angeles Rams, he allowed three catches on four targets for 102 yards and two touchdowns, but he then dominated against the New York Jets, surrendering just one reception on seven targets with an interception to boot. Perhaps the latter effort will draw a trade offer the Vikings can’t refuse. The Cleveland Browns have quickly become one of the NFL’s most dangerous teams on paper. Johnson Jr. certainly adds to that elusive offense, but he may become the odd man out with Nick Chubb and Kareem Hunt in the backfield. While Hunt’s eight-game suspension in 2019 may be reason to keep Johnson Jr., the Browns could choose to get a decent return for the former third-round pick now and test their luck in the draft or in the undrafted free agent pool — which, by the way, has been a source of big-time backfield talent in recent years (see: Austin Ekeler, Phillip Lindsay, Gus Edwards and Matt Breida, among others). Last year, Johnson Jr. saw 42 fewer carries and 29 fewer targets than he did in 2017 — due in large part to the arrival of Chubb. However, he was still just as effective on those touches, tallying the eighth-most first down catches among running backs and a strong 4.13 yards after contact per attempt that would have placed in the top five among running backs if he qualified for the snap threshold. The influx of additions to a revamped Browns squad means there will be players left grasping at air for snaps, and unfortunately for Ogbah, Olivier Vernon is just too good to not start opposite Myles Garrett. Last year, Vernon earned a career-high 86.3 overall grade and was stellar in the pass rush. 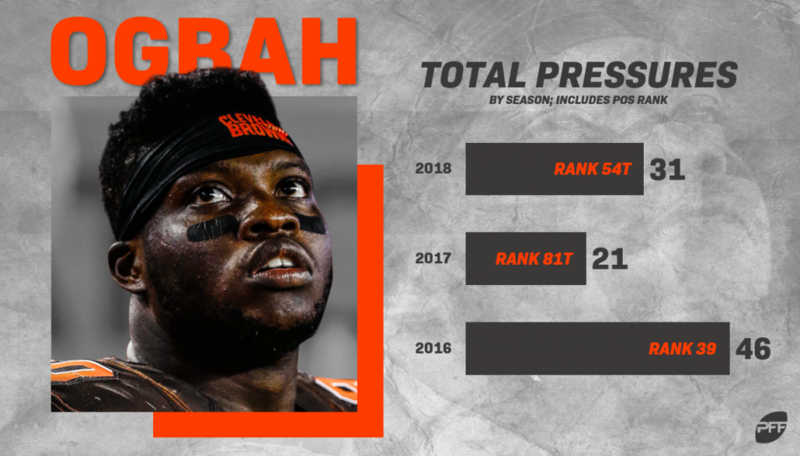 He notched four or more quarterback pressures in six of his 11 games, while Ogbah did so only three times in 14 games. Vernon also earned his accolades against the vaunted left tackles of the NFC East while Ogbah ultimately struggled against the relatively average AFC North right tackles. That’s not to say the Oklahoma State product hasn’t productive — he led the Browns in edge pressures in 2016 — but a disappointing 2018 campaign that saw him earn a 58.9 overall grade (85th of 105 qualifying edge defenders) and the arrival of a clear upgrade should have Ogbah on the market. Thomas is coming off a 26-pressure season in which 21 of them were hurries, and just one was a sack, and only two edge defenders had more pass-rushing snaps and fewer pressures than Thomas in 2018. Expectations are always high for a top-three draft pick, and Thomas just hasn’t lived up to them. 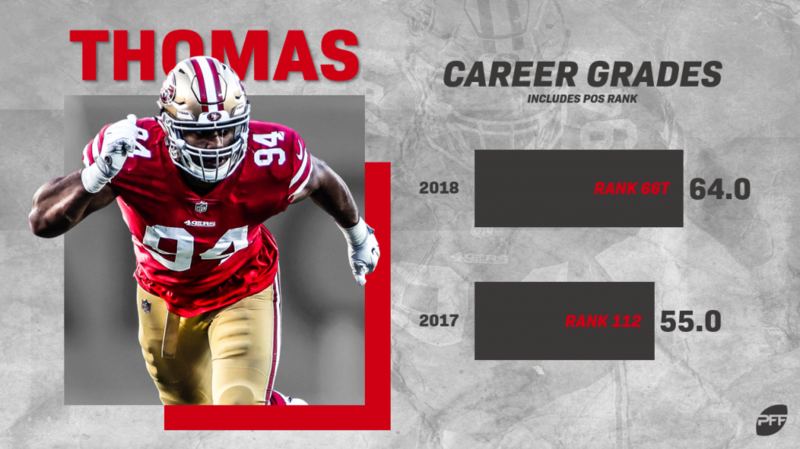 With the acquisition of Dee Ford, who finally broke out in his fifth year, the San Francisco 49ers appear more than set on their defensive line and with studs Quinnen Williams and Nick Bosa bound to be snagged early in this year’s draft, the 49ers may have even more talent on their hands, which means Thomas could be trade bait despite just getting two years to prove his worth in San Francisco.